My Opinion: 7.1 || A great feel-good movie that achieves a nearly perfect balance of sentiment and intelligence. The characters’ nearly uniform compassion and generosity may too good to be true, but Kaurismäki has a plain, unglossy (and occasionally absurd) style saves the story from becoming saccharine. 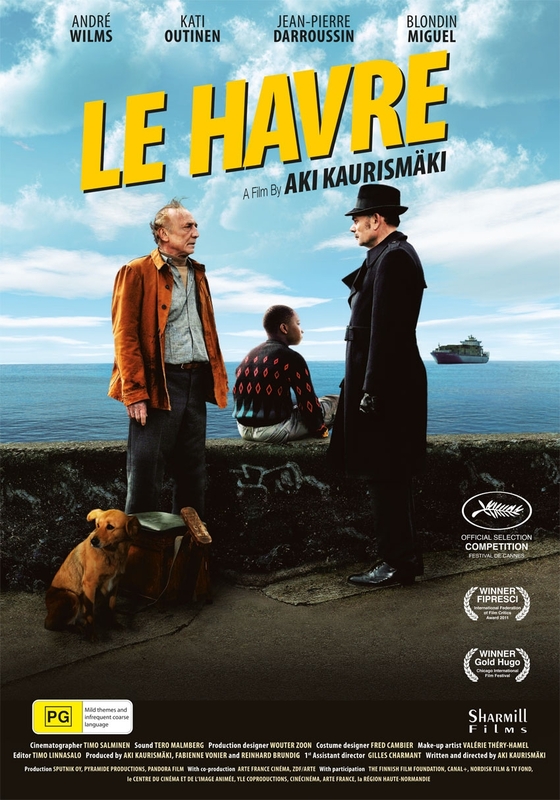 SYNOPSIS (Courtesy of IMDb): When an African boy arrives by cargo ship in the port city of Le Havre, an aging shoe shiner takes pity on the child and welcomes him into his home. Strengths: The film tells a just-believable-enough story of kind-heartedness, pluck, and generosity. It’s not so much social commentary as social modeling: Kaurismäki advocating for individual and collective compassion. In different hands, the serious subject matter could have seemed at odds with the sweet tone, and a less self-assured director might have jerked us too much between dark and light. As it is, Kaurismäki maintains just the right touch, and the tone is nicely balanced throughout. Weaknesses: Kaurismäki goes a step too far at the end with a miracle that moves us decisively into fairy-tale territory. It’s easy to understand narratively because by that point he’s painted himself into a dramatic corner — the bad outcome we’ve come to expect would have ended this otherwise upbeat film on a dreary note. Still, it’s a bit of a shame because he otherwise does a good job of keeping things just plausible enough to maintain credibility. Characters/Performances: It’s a very well-acted movie, and even the small parts are well drawn and three-dimensional. (Kaurismäki has a great feel for quirkiness, which helps when it comes to defining characters in a few strokes.) The protagonist Marcel (André Wilms) is perfectly conceived — perfectly believable as a flawed good man. Idrissa, the refugee at the heart of the story, comes dangerously close to being just a plot device. But Kaurismäki gives him just enough to do, and Blondin Miguel is an appealing actor who invests the part with personality. Best Moment: It’s a film that lives by stringing together small, nice moments. Nothing shines above the rest, but that’s not a bad thing.